In today’s world, information is everywhere around us – passwords, bookmarks, random thoughts and ideas, anniversaries, birthdays, phones, draft letters, pictures, etc… etc… etc… There are many software that aim to help manage this information: contact managers, task lists, reminders, notes apps, and a number of others. Each of these applications is good, but they aren’t great. Want great? 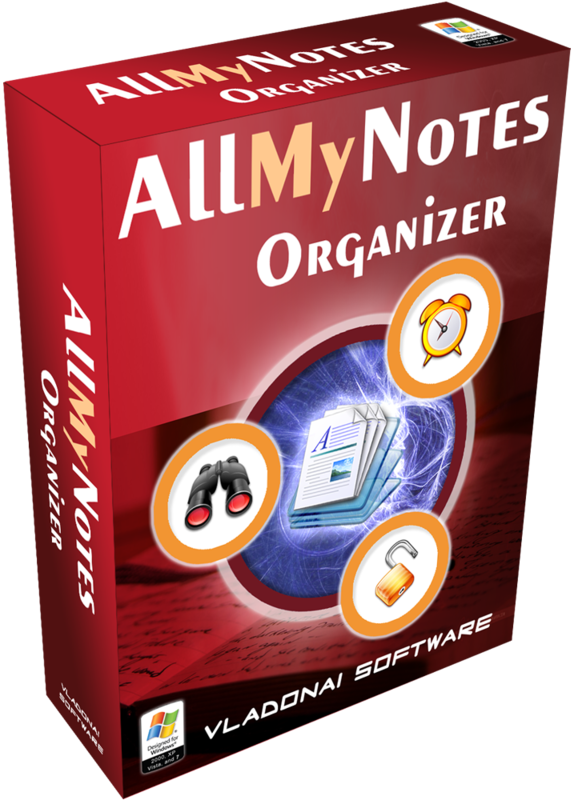 Then get AllMyNotes Organizer Deluxe. AllMyNotes Organizer Deluxe is a convenient, easy-to-use, and feature-filled tool to keep all your information organized. AllMyNotes Organizer Deluxe is designed to manage all your data and information, organize it in flexible hierarchy, restrict access to it with password, and most importantly – navigate and search through it quickly. It provides you various tools (notes, tables, alarms, checkboxes, etc. ), and you can build your information in any way you want! No more limits, no strictly defined fields, just organizing your information brick-by-brick. Hierarchical organization of your random information (free-form tree). Very fast real-time Global Search. Advanced data storage format (support >4Gb files, very fast, 1800-bit data encryption). Alarms (can be inserted at any text position). File attachments (with preview for images). Built-in Strong Password Generator utility. Call phones by double-click (Skype, or any other voip app). Quick data Capture (via system tray icon). Import/export from/to (html, rtf, knt, txt, gif, png, bmp, jpeg, and some others. A Free edition is available for data access/editing on PC where Deluxe edition is not installed . Awesome little software to organize your notes and ideas! Absolutely recommended! Excellent software, a piece of art. I knew this app for a few years, but now I am using it daily, and I like it so much. I am a developer, teacher and writter. This is really a good alternative to OneNote or EverNote, specially to write locally or in a private network, without giving our sensitive information to any cloud. The “global search” function is very efficient. And even more, “the option to filter” all notes that contains only our searching parameters: is an outstanding feature like a pure “outliner app”. The “visual skins” are very nice, specially the “night vision skins”; visually very refreshing! And “the developer Vlad” seems to be nice, professional and responsive to improve the software! Thanks a lot to S.O.S. and Vlad. Highly recommended definitively!!! Frank. In older times, the only way to take notes was with pen and paper. With advancement in technology, the big, bulky computers have turned into smaller, slimmer laptops and tablets that are fast and portable too. Note taking process that used to take a lot of time and effort has now become a matter of seconds, and the added benefit is being able to quickly search and reference the notes. There are a lot of applications available for this purpose, but most of them are limited and fall short on the users expectations. AllMyNotes Organizer Deluxe is an application, designed to let you write notes, tasks, to-do lists, events and other information. The text information can have photos and files as an attachment, and even reminders can be set and all the data can be backed up. The installer size is ~5MB and the installation process is simple and straightforward, taking no time at all. After launching it for the first time, a quick start wizard shows up to help you personalize the application for your use. At the first step, it let’s you choose the language and the skin to apply to the application. Moving on, it asks you to tick all the major purposes that you are going to use this application for. Then you can choose whether to start the application with Windows, and whether to turn on automatic updates or not. After this the wizard exits, and you can start using the application right away. The UI looks great as it is, but a little polishing here and there can make it look even more better. The skins can be changed, which can further improve the users visual experience. The UI is well-arranged, and all the tools and features are spread around the window to make them accessible at a click of a button. This makes the application easy to use and understand by all types of users, even the novices. At the left side, there is a structured tree view, showing different categories in which your notes and information is arranged. The bigger window on the right, is what shows folders and notes that you have saved. The toolbar on the top contains some most important tools and options. This tool does come with all the basic features, plus some features you might not find easily in any other application in the same category. Starting from the basic text and editing features, the tool contains them all. You can change font type, size, color, alignment, add bullets or numbered lists. The built-in spellchecker is there to help in case you make mistakes while taking notes at a fast pace. It also contains the great search and replace tool, to easily find a word or phrase and replace it with something else. The tool also let’s you set recurring alarms for important events or task, so you are reminded about it on regular basis. Moreover, you can attach photos and files to your notes to make them more informative, as well as create tables with backgrounds and frames. Moving further, the application also let’s you password protect all your notes and information so no one can access it. There is an option to backup all your data too, which comes in handy in many situations. Lastly, the tool can run in the background minimized in the system tray, so you can access it instantly when you need to take notes. Has many uses, can be used as notes, diaries, thoughts, ideas, letters, links, manage contacts, financial information, and also as a password organizer. Cloud back-up and sync would be great so all the information can be accessed even when you don’t have your PC or laptop with you. AllMyNotes Organizer Deluxe is a great application for note-taking, and comes packed with a great list of tools and features. All the tools and features work smoothly, without crashing or lagging. It is definitely recommended for anyone who loves to take notes and might want to enjoy the other features that this tool comes with. Purchased this program a couple of years ago but stopped using because I could not enlarge font in tree on left side without going into the program’s inner workings and making changes there. That was too complicated for me. I was hoping that in this version would allow me to do so easily. Alas, that feature is still lacking. Too bad. Thanks anyway. You can make both folder names and file names in bold lettering. You can also change the text color. Perhaps this will help for easier viewing for you. I’ve been using this for months now and I love it. It beats all the other note tools I’ve tried and I’ve tried about half a dozen others. I purchased it after trying the giveaway. Highly recommended! I used this software in the past for my business. I find it excellent. It is a definite 5 star utility, and will keep all your data in its database, instead of having thousands of documents on your computer. Very useful and easy to use. I highly recommend it. Very good software, works very well, simple and clever. Taking notes is important in almost every scenario. As such, that will quickly raise the question, which is the best note-taking application around? You could try out saving text files but that will not deliver the organization you would require. If you shift to the in-built sticky notes, you will quickly understand their limitations as I did. Thankfully, I came across AllMyNotes Organizer Deluxe. I could not assume this feature-packed app and I had to give it a try. This is what I found out while using the app. I was first impressed by its small installation file size, which made it lightweight hence easy on resources. The installation is one of the simplest you will come across. Its main window features a tree-like approach in organizing notes hence making it easy to navigate through. As personal and handy as it comes across, the AllMyNotes Organizer Deluxe app has a whole bunch of configuration options to let you choose how you want it to appear and function. To access the configuration window, click on the Tools option then select Options. From there, you could change the interface based on skin, language, and other miscellaneous settings. You could also choose whether you want the app to launch on system startup. It goes without saying that after you save sizable number of notes using AllMyNotes Organizer Deluxe, things will become a little bit confusing. Locating some notes may prove challenging in the process. Thankfully, taking advantage of the Global Search feature really simplifies the searching process. Not only does the feature show the tree location of the item you are trying to find, but also can take you to it. By virtue of using this application, most of the notes you save are important. As such, you may not have it if lose any. The software’s automatic Backup option will have you covered. To start with, you can set your preferred the Auto-save and Backup time. You can also go ahead and choose another location for the backup file. Be it creating or editing an existing note, AllMyNotes Organizer Deluxe provides a wide range of editing tools that are absolutely helpful. You will access text editing options to style your content in your preferred way. Additionally, you could set an alarm on each note, insert tables, add file and photo attachments, and insert date and time stamps. Unless you use another approach for the Backup, the method that AllMyNotes Organizer Deluxe implements can easily prove useless if your system crashes. That would be the case since you will lose everything with no online source to turn to. As such, in order to be safe, you will need a third-party application installed on your system like Dropbox then specify the backup location to the Dropbox folder. As I was using this app, I noted its warning sounds every few seconds. You will get the sound when you take a little bit longer to select an option. The sounds were irritating at the start as I had not identified their origin. AllMyNotes Organizer Deluxe has an impressive bunch of features and tools that really gives it an edge over other note taking applications. Its main downside is its lack of a cloud syncing option that would secure your notes from a system crash. A fix on the syncing option and I could easily shift from Google Keep as my daily driver. I could choose if I wanted the shortcut or not on a virtual XP 32. I have been using Allmynotes for years and have never received any warning sounds– you should take a look at your settings (AllMyNotes is highly customizable). As far as backup goes, those of us who do not back up to the cloud backup to an external hard drive. It is of course, as you say, pointless to store ANY backup on your system! You can choose the location for your AllMyNotes backup. I bought this with a promotion several years ago…Thank you, Ashraf! It has served me very well. Vlad is always responsive when I emailed questions. I use it daily….backup to dropbox. It’d be just want I need/want to ditch Outlook Tasks – except it has no built in or 3rd party way of syncing with my mobile phone – so it’s absolutely useless if I can’t see the same notes on my phone and tablet as well! OMG jump on this! I’ve been using for about 5 years .. using info managers 34 years. I was turned off by all the glitzy icons in their demo. You don’t need! I rarely use. The longer you use this the more you will appreciate! Great people behind it. I bought this after an Ashraf promo several years ago and use it daily. .. It permits you to select the backup location. Vlad, the author/owner, has been very responsive to any questions I email him. a very good program. I like it. How do you takes notes on your Windows PC? Perhaps you use sticky notes, or random text documents saved to your Dropbox folder. Well, I use sticky notes. They are quite limiting and they quickly fill up my screen. AllMyNotes Organizer promised to alleviate my suffering. I took a shot at it. Here is what I found out. I personally found AllMyNotes setup wizard quite helpful. The setup wizard lets you optimize the application for different use scenarios, from personal use to saving passwords and bookmarks. Once beyond the setup, you’ll find the program’s main interface minimalistic and easy to use. AllMyNotes uses the rather homely tree format to create an association between folders and notes. This makes isolating and manipulating notes of folders quite easy to anyone who has used a computer before. Tree navigation is one of the most common to native Windows applications. Coupling this with the powerful filter tool and password protection for specific files ensures that you can always get what you are looking for and secure your delicate files and folders as you wish. AllMyNotes pushes note taking to the limit by giving a way to insert files to each note you create and add an alarm or reminder. This makes the notes more interactive, anointing them, raising them from mere snippets of text to functional tools that’ll make your life more organized. An additional feature I found quite neat is the ability to mark my notes or folders complete. With its multiple database approach, AllMyNotes will let you run multiple personalities and encrypt the databases for extra security. You don’t have to worry about losing your data as the app automatically backs up content. For once, AllMyNotes’ editing capabilities piqued my interest. Other than supporting in-note images, it also lets me insert tables, dates and time stamps, format my text’s color, font and alignment and include other useful bits and pieces like checkboxes and lists. I threw in a couple of notes with similar texts and tried the search tool. I found it rather impressive at matching my search strings with the database’s contents. I am sure it will perform optimally even on thousands of notes. I personally hate shortcuts littering my desktop. AllMyNotes thought that I need a shortcut and didn’t ask for my consent. I know its petty, but hey! Not cool. The tree based navigation is good, but I think it gives the app a yester-decade appearance. A couple of panes and tabs would have brought it closer to the modern day UX. A backup is useless if it is in the same storage location as the original. AllMyNotes thinks saving the backups at the database location is by default a good idea. It would be better if the developers added an option that lets you choose the backup location on the app’s maiden launch. You can change the location manually via the options menu. AllMyNotes is an ultimate game changer. It packs quite the punch in the world dominated by rather limiting note-taking tools. It will be the ultimate tool with a couple of changes here and there and some cloud storage support. For now, it’s the best you got if you don’t mind the lack for cloud sync support. I’ve been using the paid PRO version for years now and I am very satisfied. There is a quite stable beta of version 3 on the developer site. This has a slightly modernized UI and some new useful features. Up to now the beta version never had any problems. I mention this, because if somebody decides to buy the software this update will be free of charge as far as I know. Maybe the developer can make a clear statement on this. I emphasize the very fast and professional support from the developer. My questions were answered within a few hours. That was quite impressive for such a small company. The portable mode is a great feature. So I can take my notes with me. That is something I prefer over a cloud sync, because so I do not depend on a internet connection. The program is really small in size and does not require much system resources. One big pro is that it does NOT depend on .NET or any other runtime. So it virtually runs on any Windows computer. Concerning the request for tabs or panes I am a little bit unsure whether this would improve the usability. I am missing a kind of split screen to open more than none note at once. This would improve the way to work with notes, if you copy&paste or if you want to use the same structure on your notes. Furthermore this would give the user the option to add a kind of “sticky” note. A kind of bookmark pane would be great, too. I would be great to have the option to create templates. Good review. I take issue with most your negatives. After doing taxes on line I decided I didn’t want them stored in normal .pdf or doc format. Put all in one folder called financial and just pasting .pdf leaves an Icon that opens the entire .pdf not external put inside All my notes. My main file is “All my life” – dump as much as possible to this. Then have for Computer info, Medical, cooking, and a few others. @Dennis, regarding your Con of automatically installing shortcuts. At the point during the install routine where it shows the Start Menu location choice, there is a tick box under the display list which offers, “Do not create shortcuts”. This con can be removed from your Con list. I personally own the Lifetime Deluxe version and it is an excellent note taking, retrieval program. I have three knocks toward it. 1. At time it requires a lot of clicking to see a note. 2. Personally do not like the little box surrounding the selected menu icon (non-beta versions). 3. It seems to have trouble with some tables I have copy and pasted into the program. Another great note taking software is My Notes Keeper. It can do a ton of things and yet to have any real issue with it. Pick this up while it is offered free; it is unlikely you will be disappointed. Actually, it’s precisely the fact that I don’t need a cloud or am constantly pushed to move cloudward when using it that makes AllMyNotes attractive to me … I think I might like to try it.